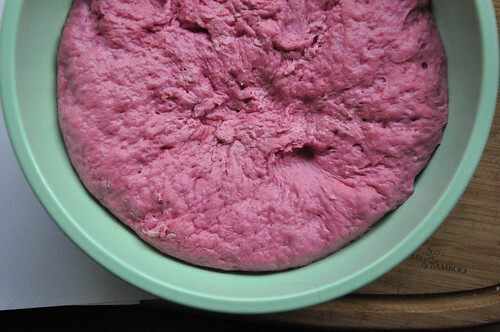 neverhomemaker: Beet Pizza Dough. Seriously. If you've been reading us for a while, you know that pizza (in its various forms) is basically our favorite thing to eat. So, when Stephen asked me what I wanted for dinner last night . . . on day 2 of our whole 5-day anniversary celebration . . . I didn't beg him to take me out. Nor did I beg for takeout (because we've been maxing out our funds on Indian lately -- woah!). Instead, I told him I'd take care of the meal. That what we were going to feast on was pizza, but that the rest was, well, a secret. Thankfully, he was (and is always) game for my crazy creations. OK. One of our best recipes on this site is pumpkin pizza dough. We use it for garlic knots, too. However, I've been getting a bit tired of pumpkin -- I mean, we've been using it in EVERYthing lately. So much that some of our Twitter followers have told us we make them feel like they're not getting enough orange in their diets. While this may be true, we took these comments as a wakeup -- we need to vary our routine a bit. Foremost: I needed to find some sort of puree to use in place of pumpkin. A quick trip to the pantry later . . . BEETS were all I could think about. We had two shiny new cans just waiting to be used. Our last beet-tastic creation, Mose's Apple-Beet Muffins, were on the sweet side. So, putting the pretty stuff in pizza dough meant we could experiment with the savory side. Basically, this dough doesn't taste weird. It's extremely pretty. And it's a new way to use beets, as if you were looking for one. Though, maybe you should be! Beets are "rich in natural sugar, sodium, sulphur, chlorine, iodine, copper and vitamin B1, B2, C and bioflavonoids" (Source). 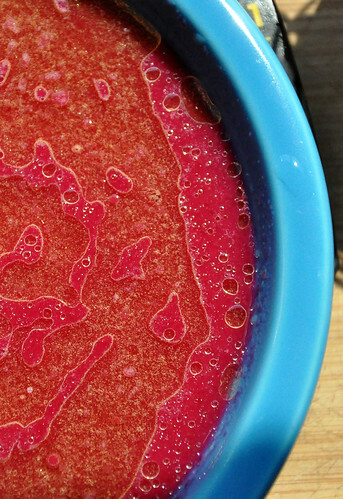 To make beet puree: Simply drain your canned beets -- but keep the water they came in (it's extremely red). NOTE: Since the beets are packed with a bit of salt, I've omitted the salt that typically is included in this recipe. 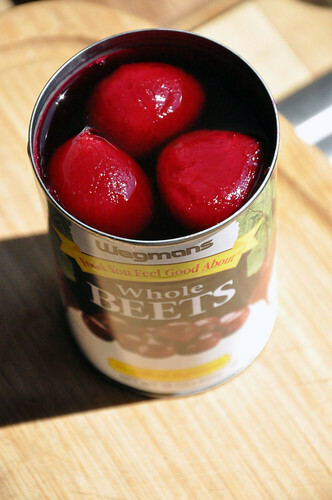 Then place the canned beats in a food processor and add about a tablespoon of the beet water to them. Pulse until smooth. 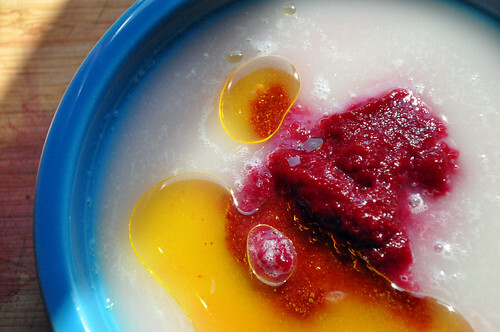 Add a bit more beet water until the texture resembles applesauce (or canned pumpkin). It's that easy. 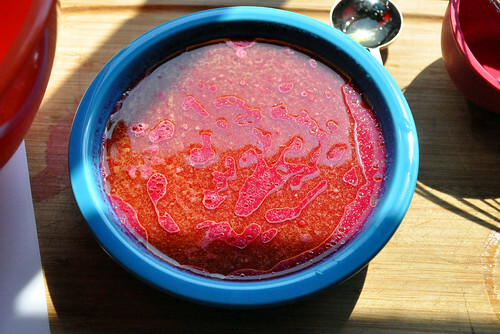 Store the remaining beet puree from sauce (recipe coming next week) . . . or whatever else you can think to put it in. 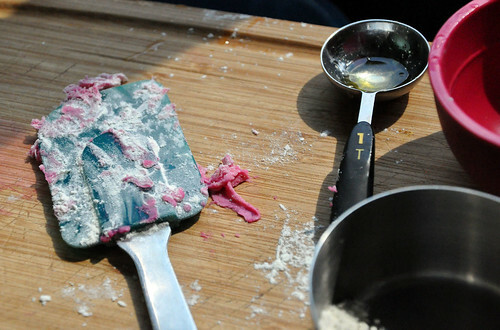 What I couldn't get over the whole time I was making this dough is the colors. Just vivid red. Gorgeous! To make the dough, you can simply follow the instructions on the pumpkin dough page (just substitute your beet puree for the pumpkin). Or here's the abridged version: Sprinkle the yeast into the warm water and stir with a fork. Let sit for about five minutes. Then add in the beet puree, olive oil, and agave nectar. Mix until well incorporated. Whisk the bread flour in a large bowl and use your fist to punch an impression (like a small bowl) into it. Then pour your wet ingredients into this hole . . . stir with a spatula and then knead with your hands until the ball is soft and elastic. Let rise in the bowl (add a bit of olive oil) -- covered with either plastic wrap or a damp towel -- for 2 hours. 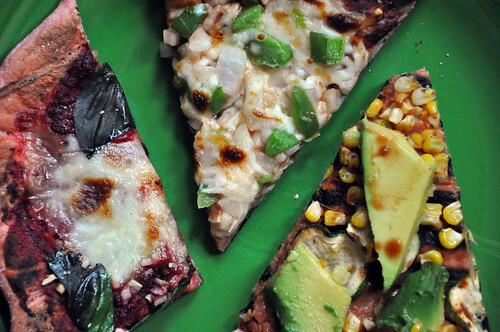 Make pizza as you would with any other dough (we recommend grilling, if you can). 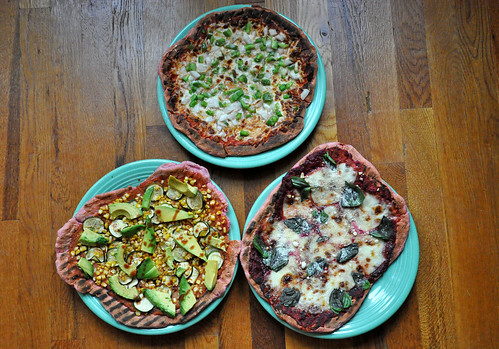 But stay tuned for some really crazy toppings we created, including a cinnamon-cocoa beet sauce (OMG, that sounds AWFUL when I write it) and a vegan mexican pizza. Yeah. There's really some good stuff!!! When you're given the choice, do you prefer to go out to eat, get takeout, or eat in? More and more, we favor lavish at-home meals. They don't only save us money, but we have the opportunity to hone our cooking skills. We learn new techniques and utilize new ingredients -- loads of geeky fun! Just leave us a comment or email us at neverhomemaker [at] gmail [dot] com.